Jill Made It: Chocolate Celebration Cake Recipe--Happy Birthday to Me! Chocolate Celebration Cake Recipe--Happy Birthday to Me! Happy birthday to me! It was my birthday recently, and I got some really great stuff, like a book about making patterns from clothes you already have (and altering the patterns to create new designs), and another about machine quilting in sections. Oooh, I can't wait! 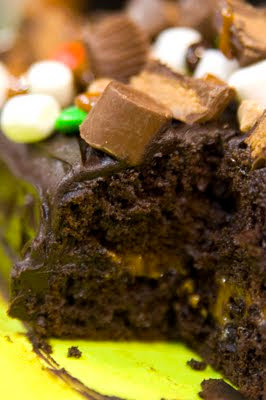 Chocolate Celebration Cake--is it chocolate for a celebration, or a celebration of chocolate. I'll let you decide. Hey, no licking the screen. 1 box of your favorite chocolate cake mix, and the ingredients to make it. Make the cake according to the package directions. Bake it in two square/circle pans--we're making a layer cake. The dulce de leche or other caramel goes on now. Save some to drizzle on at the end. Then top with the second cake layer. Pile the cake high with your chocolate! 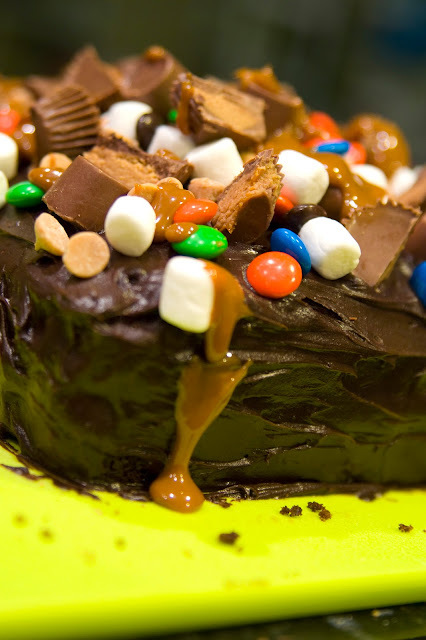 If it's chocolate, or tastes good with chocolate, it can go on this cake! I used Reese's peanut butter cups, Rolos, M&Ms, peanut butter chips, and mini marshmallows. 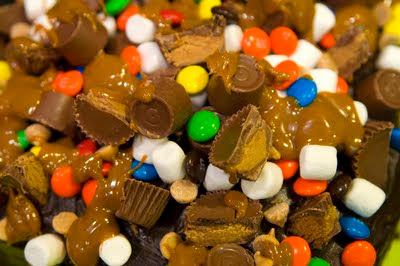 The M&Ms and marshmallows helped break up the large amounts of (delicious, but not very colorful) chocolate. To add additional visual appeal, I cut my peanut butter cups in half, to show the centers. Drizzle the leftover caramel over all the chocolate goodness. Now all that's left is to enjoy you're amazing deliciousness! Yummm! I should have heated up the caramel a bit more so it would flow better. Oh, well. Tasted great anyways! So much chocolate. So much caramel. So good. This recipe is adapted from one I found in the Taste of Home magazine. oh yummy! looks so good! Looks sinfully delicious! I'm from Blogaholic, welcome! WOW!!! Looks like a great cake for me! Great pics, looks yummy! New follower from blogaholic, have a great evening! no licking the screen! that makes me want to do it even more!